A school girl from the Sacred Heart Convent born in a renowned bourgeois French family ("Rhum Negrita") performs on the theater stage, then travels internationally as a showgirl and stripper and finally finds her niche as a holistic healer in Santa Fe. Showgirl with a Sacred Heart traces my evolution from glamor and drama to substance and serenity. Hopefully, my circuitous route to inner peace will inspire readers in the midst of their own journey. Women will be stimulated to live the life they really want to live! 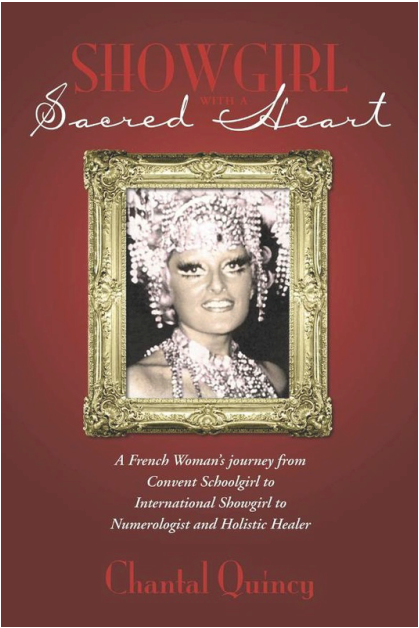 Showgirl with a Sacred Heart describes my life from birth in Bordeaux, France, in 1941, through a strict Catholic education to studies in Paris and London, acting on the French stage to traveling around the world as a glamorous showgirl. I perform with various dance troupes through South America, Japan and Southeast Asia, until I go solo as a stripper. In Hong Kong, my “loving” boyfriend David reveals himself as a con artist when we travel to Istanbul and ultimately disappears into thin air. In Kuala Lumpur, I team up with a Trinidadian singer, Ben Pachett. We become a singing duo performing throughout Southeast Asia, adding occasionally to our repertoire a risqué dance act. Then, we form our own Trinidad Steel Band performing also in South East Asia. Five years later we separate and I find myself ready to engage on a new path. In 1981 I move to New York where I study numerology and shiatsu massage. Seven years later I am called to live in Santa Fe, New Mexico, where I explore many different healing modalities, including Quantum Touch, Qi Gong and more. At age 70, I retire from being a massage therapist at Ten Thousand Waves Japanese Spa in Santa Fe. I find an outlet for my artistic temperament by being an Aesthetic Coordinator at the same Spa. I also offer private numerology readings and Feng Shui consultations. The touch of numerology incorporated at the end of each chapter brings an unexpected ratification to the events of my life and give the readers the choice to apply this ancient science to their own lives. A large number of readers would be enthralled by the captivating flavor of my adventures and the colorful characters that have crossed my path. Others can find interest in my travels and the aspects of holistic health, and the French reader because of my background.
" DARE TO LIVE THE LIFE YOU REALLY WANT TO LIVE"